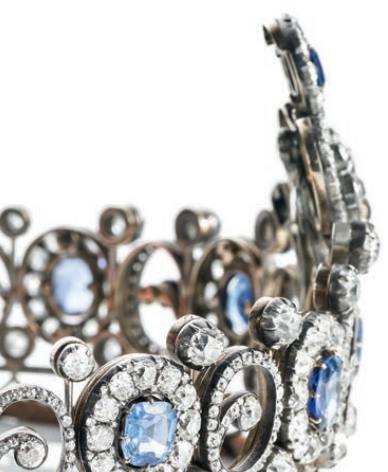 This Friday, the Danish auction house Bruun Rasmussen will offer a collection of art and art objects with Russian provenance, and one of the items has a very important royal connection: Queen Alexandrine's Russian Sapphire Tiara is being sold by her Rosenborg descendants. The tiara, originally a convertible necklace/bandeau, was given to Alexandrine as a wedding present by Emperor Nicholas II and Empress Alexandra of Russia. The tsar and tsarina were relatives: Alexandrine's mother, Grand Duchess Anastasia Mikhailovna of Russia, was a cousin of the emperor. There was another family link, too -- Nicholas's mother, Empress Marie Feodorovna, had been born Princess Dagmar of Denmark. She was an aunt of the groom, the future King Christian X of Denmark. 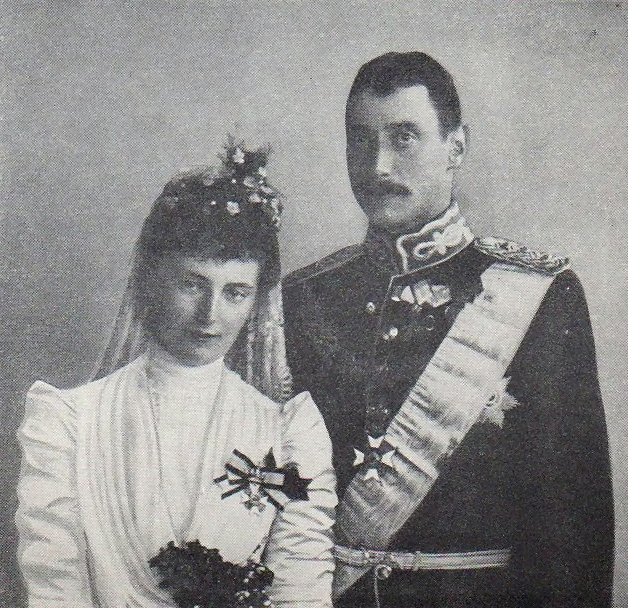 Nicholas and Alexandra turned to the Russian court jeweler, Bolin, for a suitable present for Christian and Alexandrine's wedding, which was at her widowed mother's home in France in 1898. The emperor and empress split the cost of the diamond and sapphire necklace produced by Bolin for Alexandrine, paying just under 4,000 rubles each. 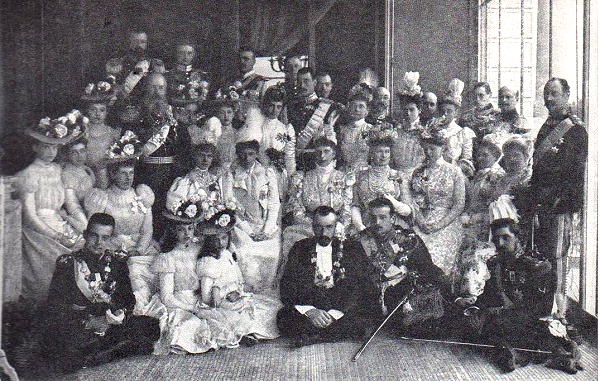 Neither Nicholas nor Alexandra attended the wedding, which was quite small for the wedding of a future king and queen; it had been postponed because Alexandrine's father had died unexpectedly the previous year. 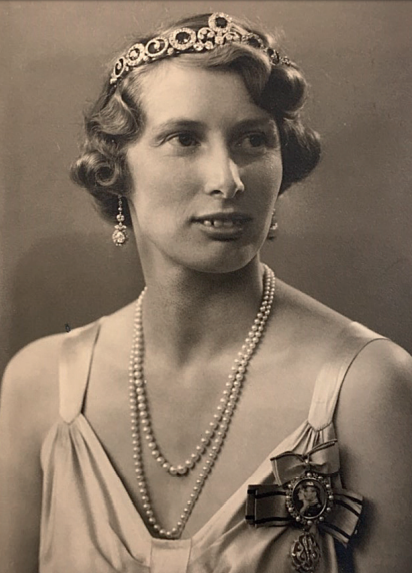 Queen Margrethe II, Alexandrine's granddaughter, has stated previously that her grandmother was not really much of a jewelry fan, and so it's perhaps unsurprising that there appear to be no photographs of Alexandrine wearing the piece as a bandeau or a choker-style necklace. Different sections of the piece were able to be detached for wear in various configurations, though, and Alexandrine used them as pendants and brooches. In 1933, she handed the piece over to the next generation, offering it as a wedding gift to her new daughter-in-law, Princess Caroline-Mathilde, wife of her second son, Hereditary Prince Knud. Above, you can see Caroline-Mathilde wearing the piece as a bandeau in a formal portrait photograph from the auction house catalogue. For several decades, Caroline-Mathilde took advantage of the piece's versatility, wearing it in various forms. But in the 1960s, she turned to the Danish court jeweler, A. Michelsen, to convert the piece permanently into a traditional tiara. 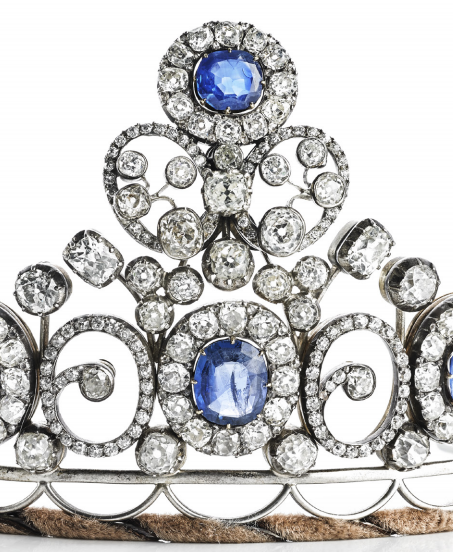 The changes resulted in the present-day diadem, described in detail in the auction catalogue as a "sapphire tiara, set with eight oval-cut sapphires, as well as numerous old mine- and single-cut diamonds. Designed with a raised heart-shaped centre and flower buds, over which a horizontal oval-cut sapphire encircled by diamonds, below thirteen oval and vertical scrolling links increasing size from right and left towards the centre part, seven links set with an oval-cut sapphire encircled by diamonds, between which six open links in the form of swirls set with diamonds, among each link a raised flower bud, below a number of diamonds on a curved circlet wound with velvet ribbon, mounted in gold and silver." I always thought the arrangement of this tiara looked more mid 20th century than late 19th century, and indeed, that's partly because of the way Michelsen set the existing elements on the frame. Also, note the design similarities between parts of the tiara and other royal jewels. The top element echoes Princess Benedikte's heart-shaped brooch; the swirling scroll elements recall the bandeau that belonged to Princess Marina, Duchess of Kent. Princess Caroline-Mathilde died in 1995, and the tiara was inherited by her third child, Count Christian of Rosenborg. Two years later, he presented the tiara to his wife, Countess Anne-Dorte, as a fiftieth birthday present. 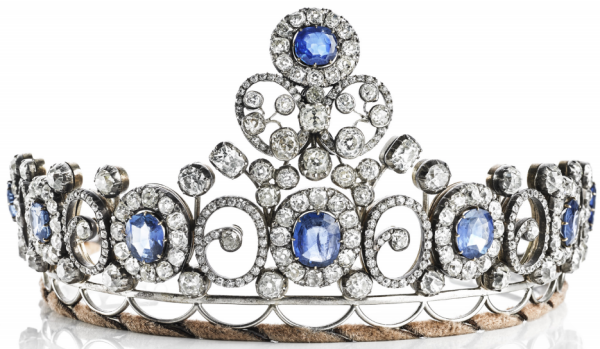 The auction catalogue notes that the gift was accompanied by a birthday card that noted that the tiara "has been your mother-in-law's and before that her mother-in-law's," emphasizing the long family legacy of the piece. 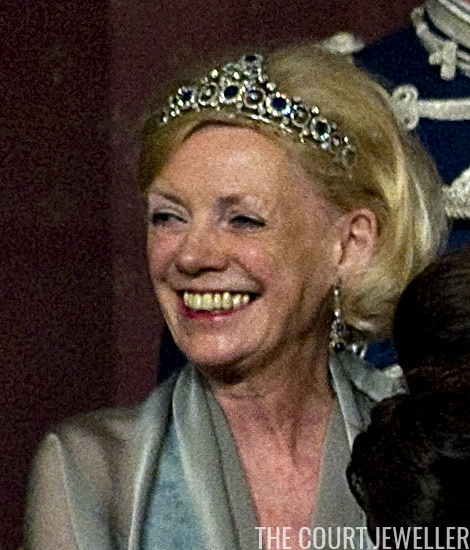 Anne-Dorte wore the tiara for various Danish royal family functions, including the seventieth birthday celebrations of Queen Margrethe II in April 2010. Count Christian died in 2013, and Countess Anne-Dorte passed a mere seven months later, dying of cancer in 2014. The tiara was bequeathed to their daughters, Countess Josephine, Countess Camilla, and Countess Feodora. The trio also recently inherited jewels from their late aunt, Princess Elisabeth of Denmark, which are also included in the Bruun Rasmussen sale. It's really quite understandable, though of course a little melancholy, that they have chosen to part with many of the family's jewels. The further you are from the crown, the less often you have the chance to get any sort of use out of grand gala jewelry. 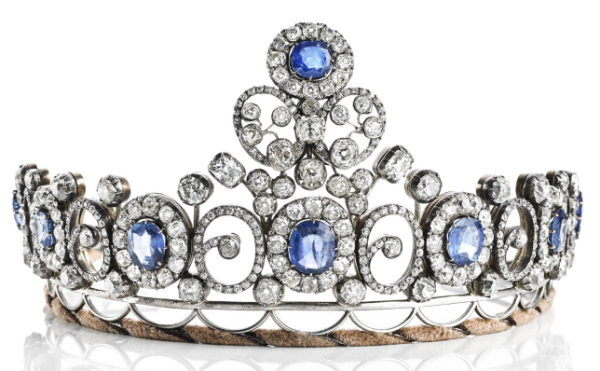 The tiara is estimated to sell for between 200,000 and 270,000 euros (or around $226,000-$306,000 USD).